​​Have you ever left your doctor's office wishing you could have more time? In today's primary care visit, time is short and there are many issues to cover. How can you be effective and respectful of your doctor's time and get answers to you want? Speaker: Robin Shapiro, Founder & Board Chair of WASHAA. ​Join Robin for a fun and interactive session on how to make the most of your doctor visit. She has spent her career helping patients find their voice and understand how to improve their care. 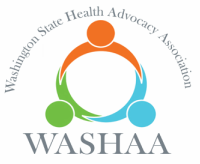 Robin currently is Board Chair of WASHAA, a non-profit organization dedicated to raising awareness about what health advocacy is and connecting people to health resources.